Heat oven to 350°F. In large bowl, mix flour and powdered sugar. With pastry blender, cut in butter until mixture looks like fine crumbs. In bottom of ungreased 13x9-inch pan, press mixture evenly. Bake 20 to 30 minutes or until light golden brown. Cool completely, about 40 minutes. In large bowl, mix limeade and yogurt with wire whisk until blended. Beat in pudding mix until well blended. Let stand 5 minutes to thicken. Stir lime peel into yogurt mixture. Gently stir in whipped topping and food color until desired green color. Pour yogurt mixture over cooled crust; spread evenly. Refrigerate at least 2 hours before serving. For squares, cut into 6 rows by 4 rows. 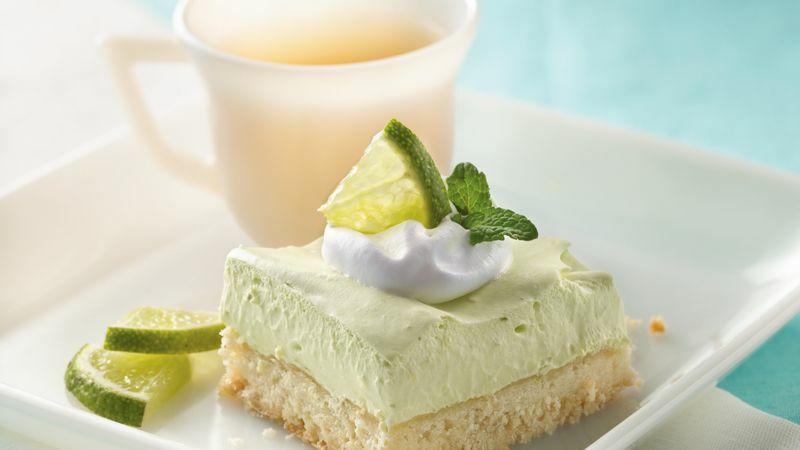 Serve each square topped with extra whipped topping, lime slice and mint leaf. This is a great recipe to make the night before an event, since it needs to be refrigerated at least two hours. If you don't have a pastry blender, you can cut the butter into the flour and sugar mixture by pulling two table knives through the mixture in opposite directions.